If the Chargers keep playing like this at home, it will be tough for Qualcomm Stadium to not sell out. The four-time defending AFC West champion Chargers dominated the Arizona Cardinals, the two-time defending NFC West champs, 41-7 on Sunday as both the offense and defense came up huge. 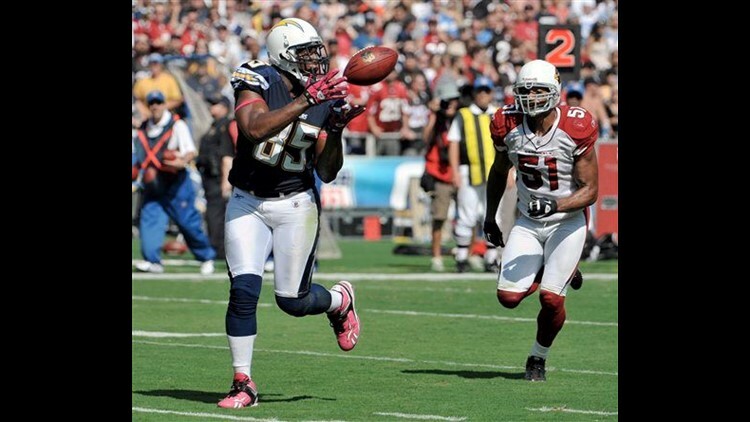 Fans who couldn't watch the game on television due to a blackout missed Antonio Gates become the seventh tight end in NFL history with 500 catches, including two touchdown receptions of 33 and 26 yards from Philip Rivers. Gates had seven catches for 144 yards as the Chargers pulled to 2-2. Rookie running back Ryan Mathews scored his first NFL touchdown on a 15-yard run late in the third quarter. But it was the Mike Tolbert show once again out of the backfield, as the fullback ran 16 times for 100 yards — his first 100-yard game in three seasons — and one score. The Chargers have scored 79 combined points in their first two home games, neither of which has been televised. The defense came up big with nine sacks and three takeaways to drop Arizona to 2-2. Linebacker Shaun Phillips had a career-high four sacks and also returned an interception of Derek Anderson 31 yards for a touchdown late in the second quarter. Max Hall then replaced Anderson, who was 7 of 14 for 64 yards with two interceptions and three sacks, for a 23.2 quarterback rating. Hall didn't fare much better with the Cardinals' offensive line. He was sacked six times and lost a fumble. Linebacker Kevin Burnett had two sacks and forced a fumble by Hall that Luis Castillo recovered. The San Diego secondary held arguably the most talented player on the field, wide receiver Larry Fitzgerald, in check. Fitzgerald was Arizona's only real source of offense with seven catches for 56 yards. The Chargers also tightened their kickoff coverage after allowing Leon Washington to score on kickoff returns of 101 and 99 yards in a 27-20 Seattle victory a week earlier. The Cardinals gained only 89 yards in the first three quarters while the Chargers had 258. The Cardinals had minus 12 yards in the third quarter, courtesy of four sacks. San Diego again proved that their offensive arsenal is among the best in the league. The Chargers converted eight plays of 20 or more yards and didn't kick their first punt until 7:22 remained in the fourth quarter. Phillip Rivers was nearly flawless, connecting on 15 of 20 attempts for 241 yards and two touchdowns, for a 148.1 rating. The Chargers scored touchdowns on three of their first four possessions. The Cardinals had the advantage of field position early, but, realistically, the Chargers offense was in position to score any time it was on the field. They had touchdown drives of 89, 63 and 65 yards in the first half. The Cardinals defense did score the team's only touchdown of the day, a 42-yard rumble return by Kerry Rhodes. In all three years under Norv Turner, the Chargers have started 2-3. They have a chance to put an end to that streak as they travel to the Oakland Coliseum to take on the Raiders next Sunday at 1:15 p.m.